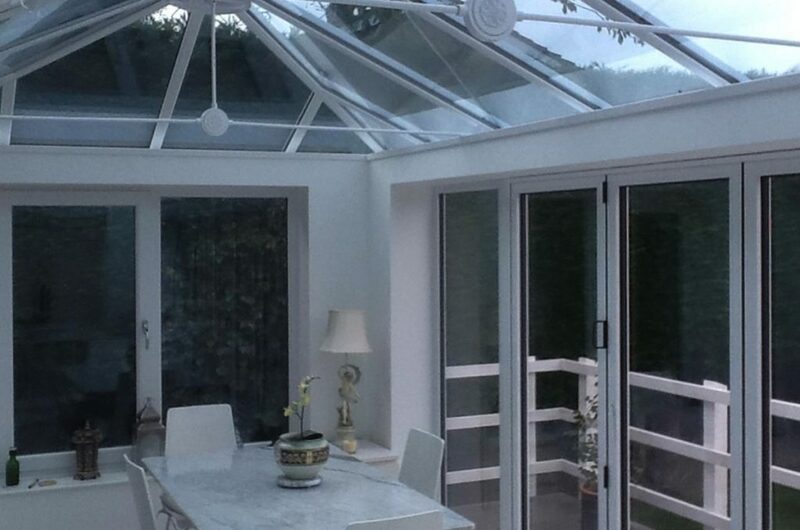 Folding Doors In Hemingford-Grey Conservatory. When the owners of this Hemingford-Grey property wanted to add more living space to their 1970’s home, they approached the Cambridge Conservatory Centre to see what could be done to give them what they were looking for. Their house lacked the space they wanted and although there was an existing outdoor area that was accessible from the living room, it was largely unusable due to the English weather. Designing an extension that would give them shelter from the weather while retaining light in the main building seemed to be the obvious solution. The new extension spans the entire width of the back of the house giving plenty of space for both a sitting area and a space to dine. 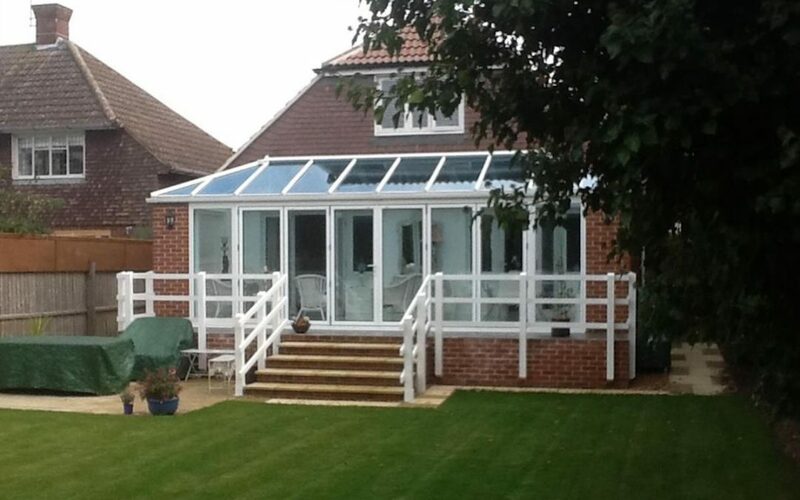 A large brick extension that matches the brick on the main house was added to the existing patio to support the new glass lantern roof and to provide a framework for glazing. 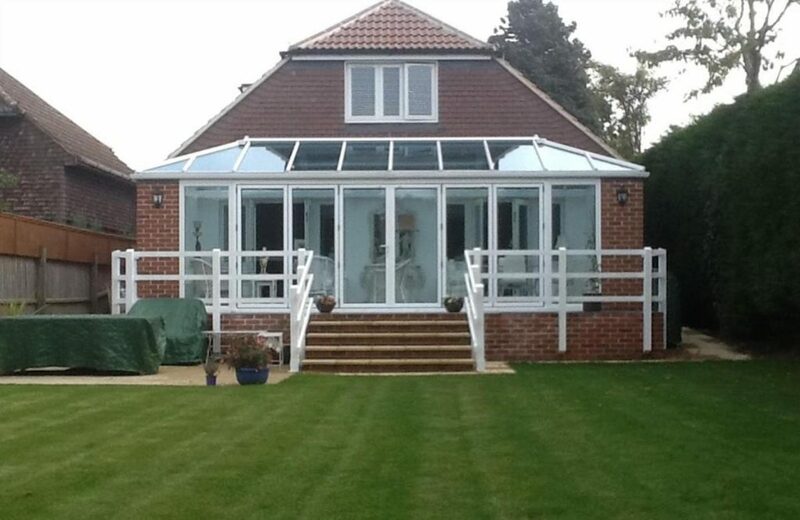 The front face of the conservatory is fitted with eight panels of glass, six of which fold open from the middle to provide a wonderfully wide access to the patio and extending the outdoor living space substantially. On each of the two sides of the conservatory a window was fitted to provide additional light and to give a view of the garden. Ornamental tie-bars were fitted to the roof to add practical stability but also to bring some detail to the light filled space. As all the glazed panels are framed in white, the overall effect is a light filled spacious room that the owners can enjoy year around. Sitting in this space is almost like sitting outside in the garden but without the adverse effects of the Hemingford-Grey weather outside the windows.